The bag axe is a small axe that was used to do all the small chores on a Trek and in camp, like cutting kindling and game prep. It was a much lighter alternative to a belt axe. It was carried in a small attached sheath stitched to the back of your hunting bag. These heads are forged from medium carbon steel with a slight hammered finish, mostly smooth. Sizes vary a little and it has an oval eye. The size is about 4 1/4"" long and has a 2" in cutting edge on average. Handles are 12 1/2" long in Hickory and Curly Maple,they have a curved bulbous end for a good grip. 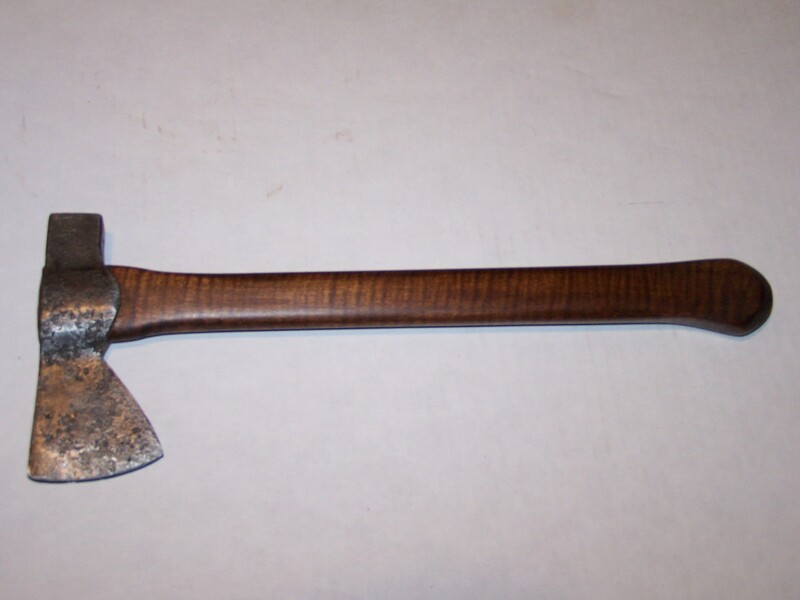 1-AH-HFH- Bag axe finished with Curly Maple or Hickory Handle, with an antiqued finished head, the plane head is antiqued to look like its been in the ground for many years, maybe dropped at a battle site....be nice to find one like that. Above in kit form w/finished head and unfinished C.M. 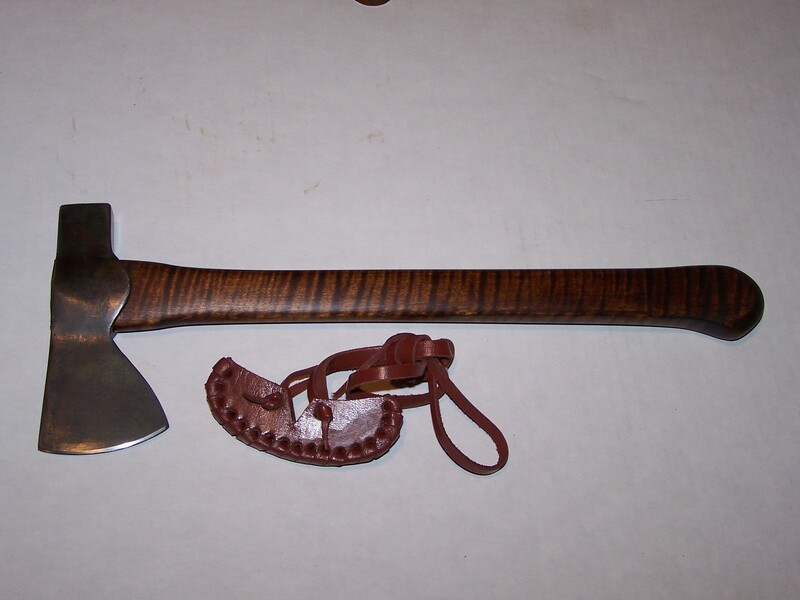 2-PH-HFH- Bag axe with plane head finished using Curly Maple or Hickory handle. Note; There is a small tip sheath in this picture, the cost is the same as the large tip sheath package. 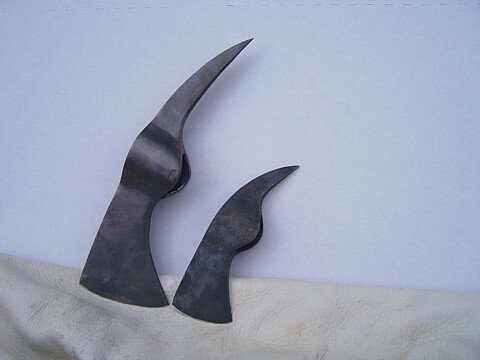 3-WA-HFH- The small war axe head is 5 1/4" long with a 2" cutting edge. This small axe would be used to put a small hole in your enemies head. Small but deadly. Small size bag axe prices are the same as the regular size ones. NOTE: There are no hickory handles for then in the thinner size ones like the curly maple ones. 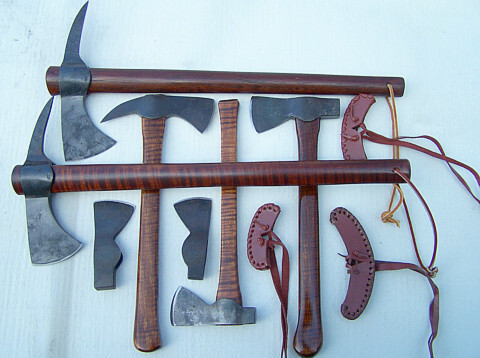 If you are getting a kit you can order the hickory one that is shown on the finished regular size axes and cut it down to size or make your own style. Head size is 3 7/8" x 1 3/4", overall length is 10 1/2". Overall length is 18 1/4"
cutting edge is 2 5/8"